The Nutrition for a Changing World (NCW) program was established in 2011 at California State University, Fullerton (CSUF) in partnership with University of California, Davis to address the growing childhood obesity epidemic. NCW aims to understand and reduce childhood obesity in diverse communities through creating an innovative education curriculum and training underserved diverse students at CSUF to increase workforce diversity in agricultural-related fields. Childhood obesity is associated not only with immediate health consequences, but also contributes to adult obesity, increases in waist circumference, chronic diseases such as diabetes, cardiovascular disease and cancer, and a reduced quality of life and life expectancy (1–12). At the same time, California’s immigrant population has substantially increased over recent decades. Data from the Public Policy Institute of California show that between 1970 and 2006, the number of California residents born abroad increased more than fivefold, from 1.8 million to 9.9 million. This shift in population demographics is significant because national studies show differences in obesity based on immigrant status (13-16). Given California’s dramatic increase in immigrant population and the fact that childhood obesity/overweight varies considerably by generational and immigrant status, education that addresses differences in ethnicity and focuses on at-risk children of immigrant and U.S.-born parents, as well as educates diverse students is critical to understand and reduce these disparities. Supported in part by a United States Department of Agriculture (USDA) Higher Education Challenge grant, # 2011-38411-30536. Committee on a Leadership Summit to Effect Change in Teaching and Learning, National Research Council. (2009). Transforming Agricultural Education for a Changing World. The National Academies Press. Weiss, J. W., Weiss, D., & Edwards, W. (2010).A descriptive multi-attribute utility model for everyday decisions. Theory and Decision, 68, 101–114. Weiss, J. W., Rubin, D., & Gomel, J. N. (2010).Physical activity among newly immigrated Latino adults. Californian Journal of Health Promotion, 7, 112-119. Mouttapa, M., Robertson, T. P., McEligot, A. J., Weiss, J. W., Hoolihan, L., Ora, Ann., & Trinh, L. (in press). The personal nutrition planner: an evaluation of a 5-week computer-tailored intervention for women. Journal of Nutrition Education and Behavior. Ora, A. G., Mouttapa, M., Weiss, J. W., & Weissmuller, P. (2008). Food security and homelessness in the city of Anaheim. Californian Journal of Health Promotion, 6, 156-172. Moczulski, V., McMahan, S., Weiss, J., Beam, W., & Chandler, L. (2007). Commuting behavior, built environment, and obesity risk among college students. American Journal of Health Studies, 22, 26-32. Koebnick, C., Smith, N., Coleman, K. J., Getahun, D., Reynolds, K., Quinn, V., … Jacobsen, S. J. (2010). Prevalence of extreme obesity in a multiethnic cohort of children and adolescents. The Journal of Pediatrics, 157(1), 26-31. Weiss, R., Dziura, J., Burgert, T. S., Tamborlane, W. V., Taksali, S. E., Yeckel, C. W., … Caprio, S. (2004). Obesity and the metabolic syndrome in children and adolescents. The New England Journal of Medicine, 350(23), 2362-2374. Rocchini, A. P. (2002). Childhood obesity and a diabetes epidemic. The New England Journal of Medicine, 346(11), 854-855. Rodriguez, M. A., Winkleby, M. A., Ahn, D., Sundquist, J., & Kraemer, H. C. (2002). Identification of population subgroups of children and adolescents with high asthma prevalence: findings from the third national health and nutrition examination survey. Archives of Pediatrics & Adolescent Medicine, 156(3), 269-275. Angulo, P. (2007). Obesity and nonalcoholic fatty liver disease. Nutrition Review, 65, S57-S63. Popkin, B. M., & Udry, J. R. (1998). Adolescent obesity increases significantly in second and third generation U.S. immigrants: the national longitudinal study of adolescent health. The Journal of Nutrition, 128(4), 701-706. Singh, G., Kogan, M. D., & Yu, S. M. (2009). Disparities in obesity and overweight prevalence among US immigrant children and adolescents by generational status. Journal of Community Health, 34(4), 271-281. Balistreri, K., & Hook, J. (2009). Socioeconomic Status and Body Mass Index Among Hispanic Children of Immigrants and Children of Natives. American Journal of Public Health, 99(12), 2238-2246. 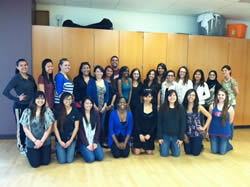 ©2012 CSUF College of Health and Human Development | Contact webmaster at ncw@fullerton.edu.